NHL News : Laviolette benches his player for nearly two full periods. 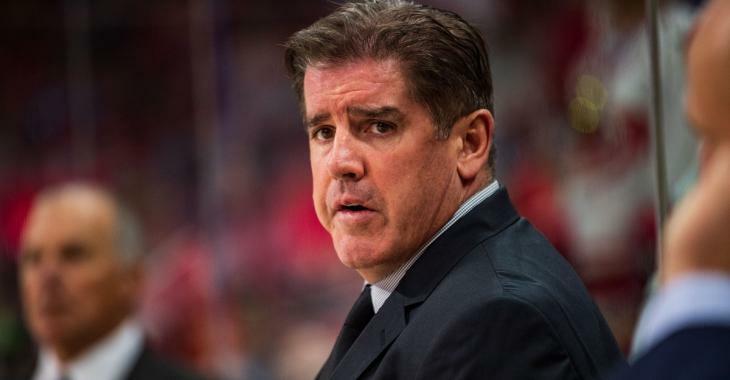 Laviolette benches his player for nearly two full periods. Predators player in the dog house? It seems like one Nashville Predators' player may be in the dog house, although there could be some other motivation behind this move. On Sunday afternoon the Predators faced off against the suddenly surging St. Louis Blues and they became the latest victims of the Blues drastic mid season turnaround. After a catastrophic start to the season that saw former St. Louis Blues head coach Mike Yeo fired and a situation so bad that the organizations top players were believed to be on the trading block the Blues now suddenly find themselves serious playoff contenders and have rattled of 6 consecutive wins in a row. For the Predators however it was anything but a good Sunday afternoon and perhaps no one felt it more than veteran National Hockey League forward Cody McLeod. The Predators enforcer saw extremely little action during Sunday's game and even appeared to land himself in the doghouse as far as Nashville Predators head coach Peter Laviolette is concerned. During Sunday's game McLeod was on the receiving end of a penalty that would eventually lead to a goal from St. Louis Blues veteran defenseman Alex Pietrangelo, a goal that could in theory have been the difference in what was eventually a one goal game. McLeod would spend the rest of the game on the bench which, according to Nashville Predators insider Adam Vingan of the Tennessean, amounted to a whopping consecutive 37 minutes and 41 seconds on the bench following the penalty. That is of course nearly two full periods of play in which McLeod was stuck riding the pine and you have to wonder if Laviolette has decided that his big bruising forward is more trouble than he is worth when games mean so much at this time of the year. Of course it may also merely be that McLeod was not feeling well or had suffered some type of injury but given that the move to bench him, and glue him to that very same bench for the remainder of the game, came immediately off the heels of the penalty called against McLeod it's hard not to jump to conclusions in that regard. No doubt Laviolette will be asked about what happened following the game.